The latest report published yesterday by the non-partisan Congressional Budget Office shows the United States faces a rapidly deteriorating fiscal situation. Beginning in 2020, the federal government will spend over $1 trillion more than it raises in revenue every single year in perpetuity. The government has to borrow money to finance these soaring deficits and that additional borrowing threatens to take our national debt to unprecedented heights. 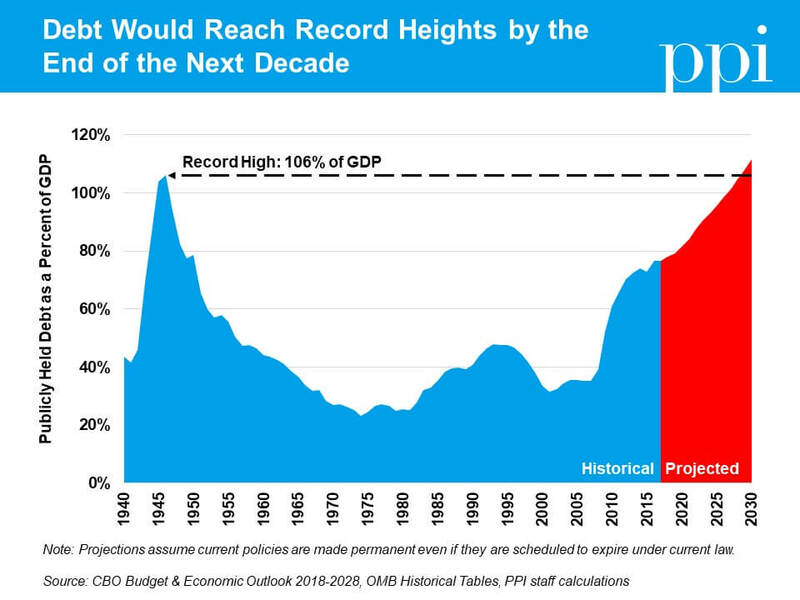 Based on CBO’s projections, PPI estimates that by 2029, the national debt relative to the size of the economy (as measured by gross domestic product) will surpass the record-high level reached just after World War II. This estimate would be six years earlier than the one in CBO’s 2016 and 2017 budget projections, where it was estimated that the national debt wouldn’t surpass its previous record until 2035, and 13 years earlier than the estimate from CBO’s 2015 budget projections. PPI’s analysis assumes recently enacted fiscal policies, including December’s Trump-Republican tax cut and February’s bipartisan budget deal, remain in place even though they are scheduled to expire under the law as currently written. This approach differs from CBO’s baseline estimates, which assume that policies scheduled to expire under current law will do so despite the fact that many lawmakers have made clear they intended for these policies to be made permanent. According to CBO, the federal government will need to borrow $2.7 trillion more over the next decade just to cover the cost of legislation enacted by Donald Trump and the Republican-controlled Congress since June. But if these policies are extended, as PPI assumes they would be, CBO says it would add another $2.6 trillion to the gap between federal revenue and spending over the next 10 years. 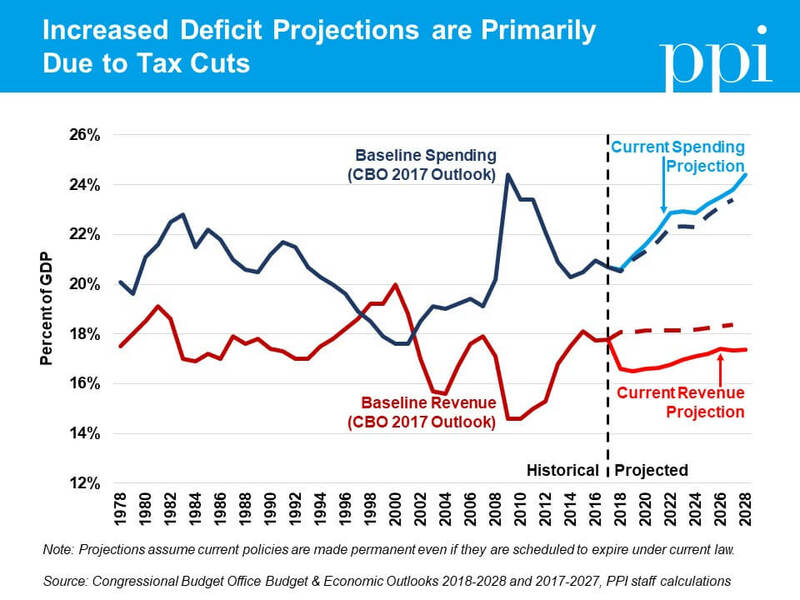 As the chart below illustrates, the vast majority of the difference between CBO’s 2017 baseline and today’s current policy projections is attributable to lower revenue estimates. Thanks to the budget-busting tax cuts passed by Congressional Republicans and signed by Donald Trump last year, federal revenue as a percent of total economic output will be lower over the next five years than it was for almost every year of the Reagan administration. These tax cuts clearly will not pay for themselves despite promises to the contrary by their supporters. Although Republican tax cuts account for most of the difference in projections, increased spending from the February’s bipartisan budget deal also contributes to the worsening deficit. The impact of this increased spending, however, is somewhat masked in the chart above by other changes in CBO’s estimates not directly related to the effects of legislation. The upshot is that current policy spending projections over the next decade are largely the same as CBO’s baseline estimates from last year. Current spending levels are relatively reasonable in the short term. Until 2020, projected federal spending as a percentage of GDP will actually be below where it was for most of the Reagan administration. But in the medium- and long-term, out-of-control spending growth will become increasingly problematic. By 2028, spending as a share of GDP is projected to reach the level it was in 2010 at the height of post-financial crisis stimulus. Unlike in 2010, future deficits will not be a temporary spike in borrowing to stabilize a collapsing economy. Rather, these deficits will be driven by the rapid growth of mandatory spending programs (those which have spending determined by formula, instead of annual appropriations by lawmakers). The largest of these programs, Social Security and Medicare, provide benefits primarily to older Americans and will grow roughly twice as fast as the economy over the next decade as more and more baby boomers retire. Medicaid, a social insurance program which serves many lower- and middle-income Americans of all ages, is also projected to grow over the next decade albeit at a slower rate. The longer policymakers put off the difficult decisions about how to make major social insurance programs financially sustainable, the more debt must be incurred to finance the deficit. That debt comes at an enormous cost: by 2026, all incoming revenue will be consumed by mandatory spending programs and rising interest payments to service our debt burden. This unsustainable trend puts enormous pressure on the discretionary programs that Congress appropriates funding for annually. Discretionary spending consists of two categories: defense and non-defense (domestic) discretionary spending. Both were increased significantly in the February budget deal, but nevertheless would shrink relative to GDP under current policy. The trend is particularly concerning for domestic discretionary spending, as it includes critical public investments such as infrastructure and scientific research that provide long-term economic benefits. Under current policy, this category of spending is soon likely to fall to its lowest level in modern history. Other mandatory programs outside of Medicare, Medicaid, and Social Security are also feeling the pressure. Many Republicans are now seeking draconian cuts to programs that serve low-income populations, such as the Temporary Assistance for Needy Families (TANF) and Supplemental Nutrition Assistance Programs (food stamps), even though this category of spending is also projected to grow significantly slower than the economy. It is ill-advised to cut programs that serve our most vulnerable when they contribute little to our country’s long-term fiscal challenges. 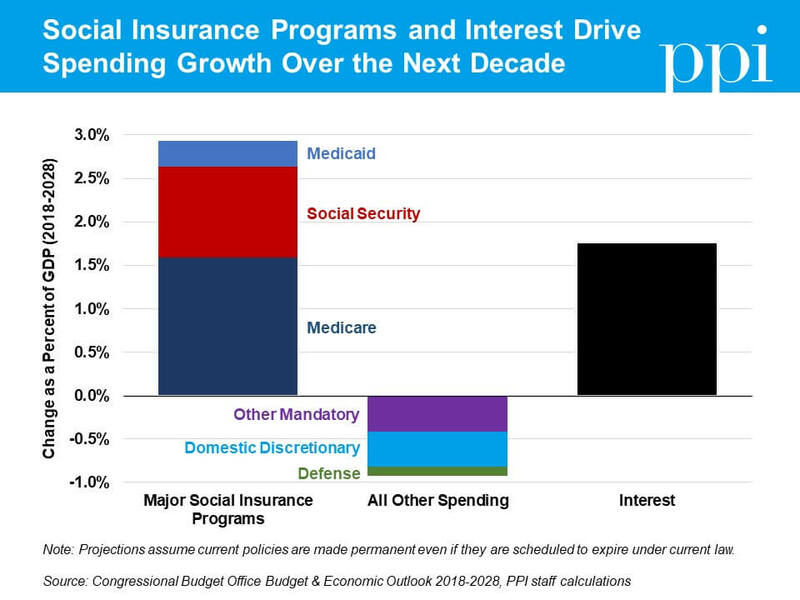 By 2026, interest on the debt will be more expensive than these other mandatory programs, defense, or domestic discretionary programs. Moreover, as the above chart shows, the growth in interest costs over the next decade is almost twice as big as the decrease in all these categories of spending combined. Solving our fiscal challenges would thus free up resources for these valuable public services and save future generations from being buried under a mountain of debt. The takeaway for policymakers is clear: in the short term, they should “repeal and replace” the disastrous tax cut package enacted by Republicans last year. But in the medium-to-long term, leaders in both parties must come together and address the growth of spending on major social insurance programs. Only a combination of the two can provide the United States with a bright and prosperous fiscal future.